Used Cars: know your rights - part 3 | What Car? What Car? has teamed up with the Government-funded consumer rights organisation Consumer Direct to help you avoid getting ripped off when buying a used car. From explaining your rights through to making a complaint, we'll help you stay one step ahead of unscrupulous car dealers. Join us for our week-long series of reports and advice. The used car business has long been a thorn in the side of consumers, and the Office of Fair Trading (OFT) has kept a close watch. In the middle of last year they began an investigation into buyers' experiences. The results paint a dim picture. One survey found that almost a fifth of consumers buying a second-hand car had experienced problems after the sale, with 86% occurring within three months of delivery. Of those that contacted the dealer, just under half said the problem was completely resolved but almost 30% said the problem had not been rectified at all. Those who paid to resolve the problem handed over an average of 465, or 752 if they'd bought the car at auction. The investigation also found that consumers show a high degree of trust in the dealers who they bought cars from, even when the dealer failed to disclose vital information. 88% of consumers didn't carry out independent history checks to see if the car had outstanding finance or a chequered past - but half of these didnt even ask or didn't think to ask if the dealer had carried out any checks. 86% of buyers didn't have an independent mechanical inspection before they bought a car, while over 70% of shoppers were shown the service history but not shown the registration document. Consumer law prevents car dealers from misleading buyers by giving false information, either verbally or in writing, or omitting information (failing to disclose). This includes failing to inform a buyer if a car has been used as a rental or lease vehicle. 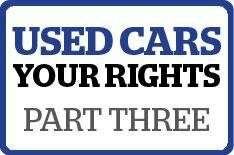 To make sure you know your rights when buying a used car visit Consumer Direct.